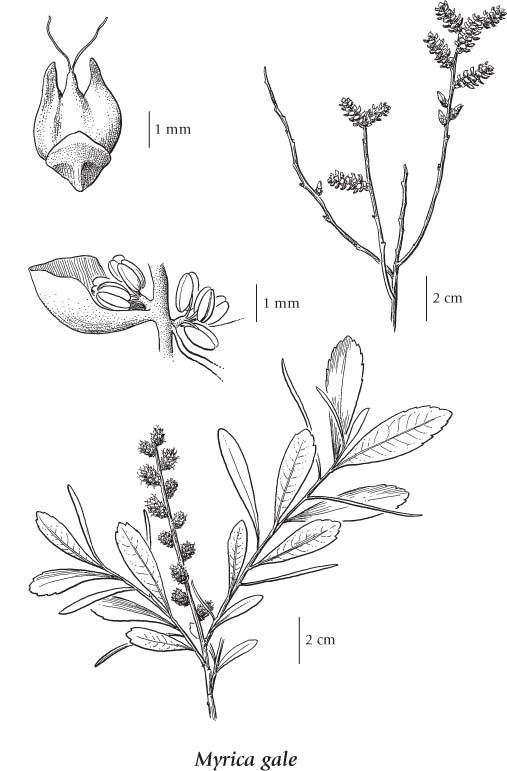 Shrub, 0.5-2 m tall, spreading by suckers; stems spreading, finely hairy when young, glabrous at maturity, loosely branched, bark dark reddish. Alternate, deciduous, oblanceolate to more oblong, 3-6 cm long, up to 2 cm wide, entire to coarsely few-toothed above the middle, hairy on both surfaces or rarely glabrous below, strongly dotted with yellow wax-glands, rounded to blunt, aromatic. Inflorescence of male and female flowers in spikes on separate plants; male catkins 1-2 cm long, the male flowers with 3-5 stamens, the filaments shorter than the anthers; female spikes 1 cm long, crowded, bractlets flattened, fused with the pistil at the base and longer than the subtending bract, yellow-waxy. Nutlets, 2.8-3 mm long, cone-like, glabrous except for wax glands. Swamps, bogs, fens, lakeshores and estuary edges in the lowland and montane zones; common in coastal BC, rare in SC and NE BC; circumboreal, N to AK, YT and NT, E to NF and S to MN, TN, NC and OR; Eurasia. A very shade-intolerant, submontane to subalpine, circumpolar deciduous shrub (trans­continental in North America). Occurs on wet to very wet, nitrogen-medium soils within boreal, wet cool temperate, and cool mesothermal climates; its occurrence increases with increasing latitude. Symbiotic with nitrogen­fIxing organisms. Common and often dominant in non-forested, semi-terrestrial communities on water-collecting sites. Occasionally grows with Carex obnupta, C. sitchensis, and Spiraea douglasii. Characteristic of wetlands. Myrica gale var. subarctica Rouss.